Ferrite cores (chokes) provide an inexpensive, and effective, way of coupling high-frequency resistance into a cable in order to reduce the common-mode current, and hence the radiation (or pickup) from the cable. They are commonly used on mouse, keyboard, video, and other peripheral cables connected to personal computers, as well as on power supply cables when a device is powered from an external transformer (wall-wart) or power supply. The ferrite core acts as a one-turn common-mode choke, and can be effective in reducing the conducted and/or radiated emission from the cable, as well as suppressing high-frequency pick-up in the cable. Basically ferrites can be thought of as high-frequency resistors, with little or no impedance at low-frequencies or dc. Ferrite cores are most effective in providing attenuation of unwanted noise signals above 10 MHz. The figure below shows a ferrite choke on a USB cable. For low-frequency cable emission problems, typically below 10 MHz, ferrite chokes have not been very useful, since their impedance is too low, at these frequencies, to be effective. I have always wished for a similar, simple low-frequency solution to cable emission/susceptibility problems. My wish finally has been granted. Recently Fair-Rite Products Corp. introduced a new low-frequency, Type 75, ferrite material optimized for EMI suppression in the 200 kHz to 30 MHz frequency range. This material has an impedance peak in the 1 to 2 MHz range. Information on the new Type 75 ferrite cores is included in Fair-Rite’s 17th edition catalog. 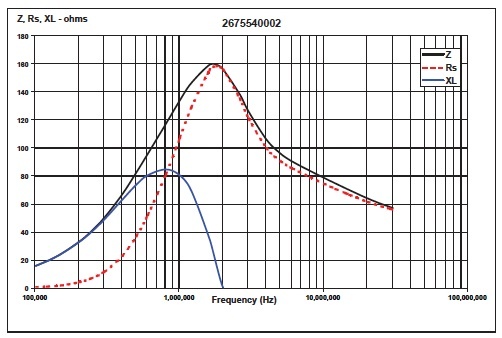 For example, part number 2675540002 (9/16″ OD, 1/4″ ID , and 1-1/8″ long core) has a peak impedance of 160 Ω at about 1.6 MHz as shown below. Type 75 ferrite cores can be especially useful in reducing emission problems in the 500 kHz to 10 MHz frequency range, across which the impedance of the above ferrite is greater than 80 Ω.. The impedance of ferrite cores can be further increased by using multiple turns. However, this also increases the inter-winding capacitance and degrades the high-frequency performance of the choke. Since the Type 75 material is intended for low-frequency use, this increase in capacitance is less of an issue, and two to five turns can be used with very little, if any, detrimental effect. 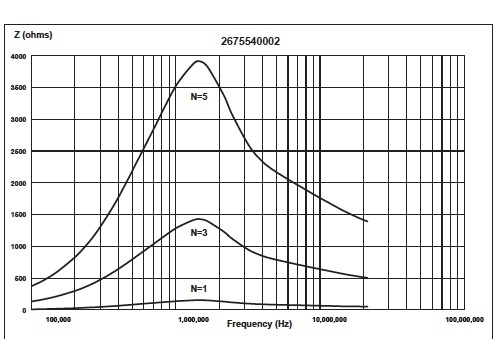 The same 2675540002 core discussed above has an impedance of 1,400 Ω at 1.3 MHz when three turns are used, and an impedance of almost 4,000 Ω when five turns are used, see below. A three turn choke using this core will have an impedance greater than 500 Ω from 300 kHz to 20 MHz. Even at 150 kHz, the low-end of the FCC/CISPR conducted emission measurement range, the three turn configuration has an impedance of approximately 250 Ω, and the five turn configuration has an impedance of approximately 700 Ω. Therefore, by using multiple turns high impedances can now be obtained at these low-frequencies. Both smaller and larger cores are available from Fair-Rite. Type 75 cores ranging from 3/8″ to 1-1/4″ OD (7/32″ to 3/4″ ID) are listed in the Fair-Rite catalog. At present only solid cores are available, but snap-on split cores should also be available later this year. Snap-on cores are convenient for troubleshooting, and can be easily applied as an after-the-fact fix to cables. Since the manganese-zinc (MnZn) Type 75 cores are slightly conductive (resistivity, ρ = 3×10^2 Ω-cm), care should be taken that they do not touch any live electrical terminals. Give the new Fair-Rite Type 75 material a try for your low-frequency emission/susceptibility cable problems. You might be pleasantly suppressed with the results. I have just posted a new article on “Workbench EMC Measurements” to the Tech Tips section of my webpage (www.hottconsultants.com). Workbench EMC measurements are simple, inexpensive, precompliance tests that a product designer can perform, in his/her own laboratory, early in the development phase of a product in order to obtain an indication of the EMC performance of the product. This post will discuss the last of my four tenets of EMC troubleshooting (see my 8/28/11 blog), Fix Implementation. When dealing with frequencies in the tens or hundreds of megacycle range, you are dealing with rf frequencies and cannot get sloppy in the way you implement EMC fixes. For example, if you believe that adding a capacitor at a certain point in your system will fix a problem, tack soldering the capacitor in with 2″ or 3″ leads, may work at audio frequencies, however, it will be completely useless at rf frequencies. The inductive reactance (impedance) of two half-inch long leads on a capacitor, at 200 MHz, will be about 20 Ω. Many times capacitor lead lengths must be 1/8″ or less in order to be effective. Therefore, at the frequencies involved with most EMC problems, a fix must be implemented almost perfectly in order to be effective. This is often very difficult to do on an existing product, having many constraints. A poorly implemented fix can have no effect at all, thereby, leading one to draw the wrong conclusion and leading you astray. I learned this principle many years ago while troubleshooting a 600 MHz emission problem. I was convinced that the emission was coming directly from one of the IC chips on the board. The IC was about one inch square. I fashioned a shield out of copper tape to cover the offending IC, and grounded it to the PCB ground plane (with very short wires) at the four corners. The EMC measurements were repeated with absolutely no improvement, which lead me to believe that I was wrong about the IC being the source of the emission. After 4 or 5 hours of trying all kind of other fixes, non of which worked, I (out of frustration) revisited my original idea that the IC was the source of the emission. This time a made a similar shield to cover the IC, but grounded it at eight points, the four corners plus half-way along each side. Wala! The emission dropped 6 dB–problem solved! Sometimes a fix cannot be implemented perfectly enough on an existing product. For example, if in the above case, there were no accessible ground points on the PCB to connect the shield to. In these cases you may just have to redesign the PCB, based on faith and knowledge that it is the correct thing to do, in order to implement the fix correctly. More often than not, it works. This ends this series discussing the four basic tenants of EMC troubleshooting. Just understanding these four principles should make you a better EMC troubleshooter. In my 8/28/11 blog I listed the four basic principles of EMC troubleshooting, the third of which I will discuss in this post. This principle gets its name from a short one-page article written by Scott Roleson in 1992. * I often refer to this method as the “Giant Step versus Baby Step” approach to EMC troubleshooting. The analogy being, if I want to walk across a room, it will take me longer to do it if I take baby steps, than if I take giant steps. When troubleshooting an EMC problem, especially on an existing product, the client always wants to make the minimal, least costly, change possible (taking baby steps). My approach is to do whatever is required to make the product compliant first, without regard to the cost or complexity (taking a giant step), then go back and refine the fix to be less costly and/or complex. In the meantime the product is compliant! Many times, potential EMC solutions are not tried because they are considered, at first glance, to be too complex or costly. For example, let’s consider the case of radiation coming from a metallic enclose which has six different apertures. The “baby step” approach to troubleshooting this product is to cover one of the apertures with copper tape and then repeat the emission test to see if that solved the problem. Nope–that did not work, so let’s put copper tape over another aperture and repeat the emission test again, etc, etc, etc. The “Kill it Dead” approach, on-the-other-hand, is to put copper tape over all the apertures and redo the emission test, in most cases the problem is now solved in one step. Then you can go back and see if the tape can be removed from some of the apertures without the problem reappearing. One should also see how this approach meshes with the Predominate Effect principal discussed in my 9/11/11 blog. Another example might be, a four-layer PCB which has many traces that are routed over splits in the power and ground planes. A quick fix would be to add two more solid ground plane layers adjacent to the trace layers, a fix that almost always works but is costly since it makes the four-layer board a six-layer board. This also quickly proves the point that the traces crossing the splits in the planes are the problem. One can then, in many cases, cost reduce the fix by completely relaying-out the four-layer board to avoid the traces crossing the splits in the planes, and accomplish the same objective, without adding the two additional layers. This is a less costly but more time-consuming fix. I think that you will find by taking the “Kill it Dead” approach, the time required to troubleshoot an EMC problem will be significantly reduced. In my next blog I will discuss the last of the four tenets of EMC troubleshooting, Fix Implementation. * Roleson, Scott, ‘The “Kill it Dead” Strategy,’ EMC Test and Design, September/October, 1992. In my 8/28/11 post, The Four Basic Tenets of EMC Troubleshooting, I discussed the four basic principles, of EMC troubleshooting, the second of which was the Predominate Effect. In this blog I will discuss the significance of this principle. An emission at any specific frequency is often caused by more than one source, and/or radiation mechanism– one of which is predominate and overshadows the others. If a fix is applied (such as a ferrite added to a cable, or reducing the size of an enclosure aperture) that decreases the magnitude of one of the non-dominant emission sources, and/or mechanisms, and the emission is remeasured–no improvement is seen, since the reduced emission is overshadowed by the magnitude of the predominate emission. This can lead to drawing a wrong conclusion, that is, that the fix had no positive effect. In order to notice an improvement, the predominate noise source must be fixed first. Therefore, in order to see an improvement, multiple noise sources must be fixed in a specific order–a difficult and time-consuming process. Many times when troubleshooting I have applied a fix that reduced the emission, but not sufficient to bring the product into compliance with the EMC regulations. Then when I propose a second fix the client says: “No that does not work, I already tried that fix.” But the client tried it before I applied my fix, that reduced the emission, therefore, it probably was not the predominate effect at that time. My response is often “humor me and try it again,” and in many cases it is now effective. One is to always revisit old fixes that did not work, after an effective fix has been applied. The second, and the one that I usually prefer, is to leave all seemingly ineffective fixes in place until the product is compliant, then remove them one at a time. Using this approach the removed fix, if it has an effect at all, will always be the predominate one. Any fix that does not increase the emission when removed, can now be eliminated. Just understanding the concept of the Predominate Effect will make your troubleshooting less confusing and easier. In a future blog I will discuss the “Kill it Dead” Strategy of EMC troubleshooting. In my 8/28/11 blog I discussed the four basic tenets of EMC troubleshooting, the first of which was Divide and Conquer. The objective of this approach is to eliminate some of the components, parts of the system, etc. from being associated with the problem, and then concentrate our troubleshooting efforts on the remaining components, parts of the system, etc. In this blog I will discuss this approach applied to the case of a radiated emission problem, and the case of a conducted emission problem. Radiated Emission Problem. In the case of a radiated emission problem it is advantages to determine if the emission is coming from the cables, or from the enclosure/PCB. Often the simplest way to do this is to remove the cables and see if the product passes without cables. If it does, the emission is coming from the cables. If not, fix the enclosure/PCB first, then worry about the cables. If the product does not pass without cables, it will never pass with cables. Of course, when removing the cables, you cannot remove the power cable. Therefore, wrap the power cable around a big ferrite core to suppress the radiation from this cable. Another approach, not requiring the removal of the cables, would be to measure the common-mode currents on the cables using a common-mode current clamp such as the Fischer Custom Communications Model F-33-1, or if the emissions are above 250 MHz, the F-61 current probe. See Measuring Common-Mode Currents on Cables. Conducted Emission Problem. The first thing to do when facing a conducted emission problem, on the power line, is to determine the frequency of the failure(s). If it is at the low end of the conducted emission spectrum, the source is most likely the switching power supply or an ineffective power line filter. If the failure is at the high end of the conducted emission spectrum, the source is most likely the digital logic. If the emission is from the switching power supply, it is desirable to next determine if the emission is from a common-mode or a differential-mode noise current – since different components in the power supply, and the power-line filter, affect differential-mode emissions and common-mode emissions. Performing the conducted emission test as specified in the various EMC regulations, will not determine this. We can, however, determine this by adding a differential-mode rejection network between the LISN and the measuring instrument. This will allow us to determine the magnitude of just the common-mode noise, see Distinguishing Between CM and DM Conducted Emissions. If you make a habit of dividing up your EMC problems as discussed in this blog, your EMC troubleshooting will be easier and will go much faster. In my next blog I will discuss the Predominate Effect principle. The lull in the middle of the storm! As I write this I am sitting at home in the eye of hurricane Irene, the rain has stopped, the wind has stopped, and the sun is almost out. In the last 10 hours we have received over 6″ of rain. I know, however, that we have at least another 8 hours of torrential rain and hurricane force winds left before this thing is actually over. My next few blogs will cover each of these basic principles individually.